Cold Comfort Cocktails: Roundup of Winter Cocktails in L.A. Nothing says cozy winter nights like a hot toddy or Irish coffee. But in L.A. thanks to our industrious and highly skilled bartenders, we’ve got so many new favorite winter cocktails to choose from. Will it be 1886’s spicy hot chocolate, Playa’s mescal nog, the Roof on Wilshire’s Earl Grey hot toddy? Here’s the roundup of some of the tastiest drinks off winter cocktail menus around town. Any one is perfect for enjoying on a balmy December afternoon or a chilly night. 1886: Con Abuelita — Described as a grown-up Mexican hot chocolate it’s made with Ancho-chile infused Reposado Tequila, 1886 hot chocolate mix and an ancho chile marshmallow. Bar at Cliff’s Edge: Bitter Pill — This bitter pill will go down easy with its mixture of Zaya Rum, Fernet Branca, lime, brown sugar syrup and egg whites. Big Bar: Scot’s Jasmine — An even cozier twist on a hot toddy which will make you want to curl up at the bar. Dewar’s, jasmine tea, honey, ginger, steamed milk. Caulfield’s: 23 Yr Old Fashion — Ron Zacapa 23 yr., housemade chocolate tincture, sugar, Luxardo cherry. Copa d’Oro: TT of Man — Famous Grouse Black Scotch, walnut liqueur, housemade maple-ginger syrup, fresh lemon & organic apple juices & pasteurized egg whites. Drago Centro: Rode Duivel — Bols Genever, St. Maria Al Monte Amaro, Miracle Mile Sour Cherry Bitters. Try this and the rest of the new winter cocktail menu which debut this Wednesday. They’ll be specially priced at just $8 for the night. 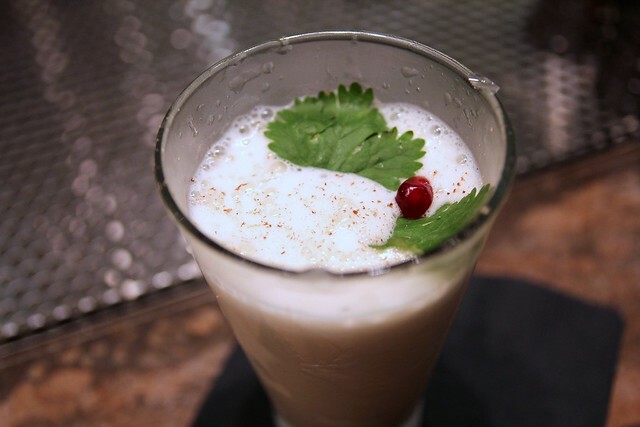 Playa: Ponche en Nogada — This nog created by Julian Cox for an L.A. Times Magazine piece evokes the coziness of a fireplace thanks to the smokey Poblano infused mescal and add to that double cream, whole egg, amontillado sherry, holiday-spiced piloncillo, nocino, and garnish with pomegranate arils and nutmeg. Ray’s and Stark Bar: Oaxacan Holiday — Cocoa infused dark rum, Crème de cacao, chocolate chili bitters, freshly whipped cream, grated nutmeg. Soho House: Cider House Rules — apple jack, fresh pressed apple cider, lemon, honey syrup, hot water, cinnamon. An apple hot toddy that’s more effective than a Snuggie. But if you’re not a Soho House member, you can make this cocktail at home. Here’s the recipe. Spare Room: Hot Buttered Bourbon — smoked salt caramel syrup, blood orange essence, bitters. “I like the idea of being able to get a hot buttered bourbon in February when its rainy and colder than it is now,” said Spare Room beverage director Naomi Schimek. Couldn’t agree more, but I suspect our 50-degree L.A. nights work just fine, too. Tasting Kitchen: Duke of Hazzard — bourbon, dates, allspice. The Roof on Wilshire: Earl the Pearl — Gosling Dark Rum, Earl Grey Vanilla Cream Tea and lemon twist and cinnamon stick garnish. Something comforting about the vanilla and maple notes of this hot toddy. Enjoy it by the firepit on the roof while looking out at the city. Villains Tavern: Lady Percy — Tullamore Dew, stewed pear cider, honey, dried apricots and bitters. One of my favorites off Villains winter list. Nicely balanced hot cider cocktail, not too much booze or too much sweet apple/pear-ness. The Writers Room: Dead Man Oaxacan — mescal, mole-orange liqueur, Mexican oregano, Chapulin garnish. 3 Responses to Cold Comfort Cocktails: Roundup of Winter Cocktails in L.A.
being a tea lover that Jasmine drink sound divine!